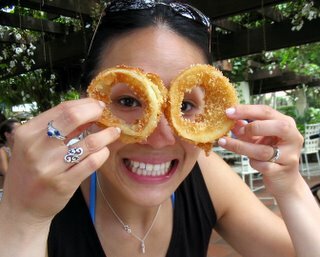 Check out the size of those onion rings. This Christmas I wrote my beautiful wife a little song. It’s partially about how I have to drag her out of bed every morning (literally by the feet as she hangs onto the pillows). I know how it feels good in the dark. I lift you up, for the world to see. mp3 temporarily available for here. must you melt everyone’s heart! hahaha… beautiful. beautiful.